Originally published in The Patriot-News on April 7, 2012. 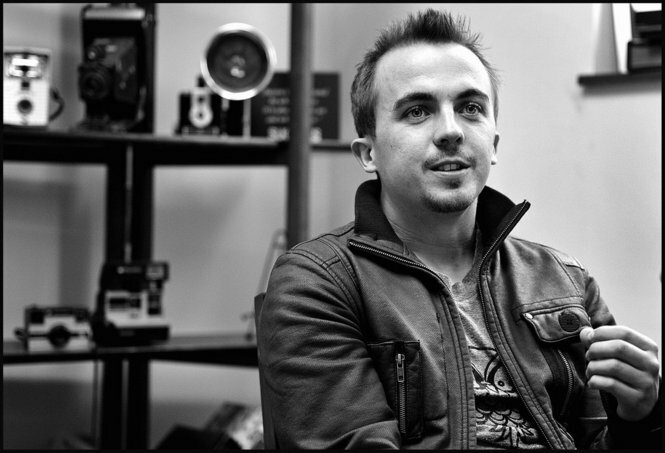 It’s Friday afternoon and Frankie Muniz has locked himself in with his drum kit. Since arriving in Harrisburg on Thursday morning, Muniz has been living and breathing the music of Kingsfoil, the York band in which he plays drums. Muniz rose to fame in 2000 as Malcolm in the hit TV series “Malcolm in the Middle.” He also played the title character in the “Agent Cody Banks” movies. After “Malcolm” ended in 2006, Muniz took a break from Hollywood and moved to Phoenix, Ariz., to be a race car driver. Two years ago, he left competitive racing to be a drummer for You Hang Up, an unsigned band in his southwestern home. Now, at age 26, Muniz has come to the midstate to pursue his drumming dream. He looks much the same as his “Malcolm” days, although the hair is a little wispier and the clean-shaven face has been replaced with a rock star’s facial hair. But it’s his strikingly blue eyes that immediately catch one’s attention. Even though Muniz had just finished an intensive 48-hour drive the day before, he was alert and excited. His words were almost always accompanied by a grin and expansive arm movements. Part of that excitement is fueled by his need to get as much accomplished as possible. With his first concert as Kingsfoil drummer just six days away in Dewey Beach, Del., Muniz is on a steep learning curve when it comes learning the band’s songs. All he needs for the first concert, though, is to be able to play 10 songs. It could be a feat for Muniz, who had never taken a drum lesson before joining Kingsfoil, even though he had been playing since he was 12.